When developing the idea of Rusted, I knew I wanted an art style that would portray the mood of the setting. And since I knew this setting was steampunk inspired while leaning towards the “wild west,” I needed something that felt old, worn, and gritty. I finally settled on going “black and white”—just without the black and white. 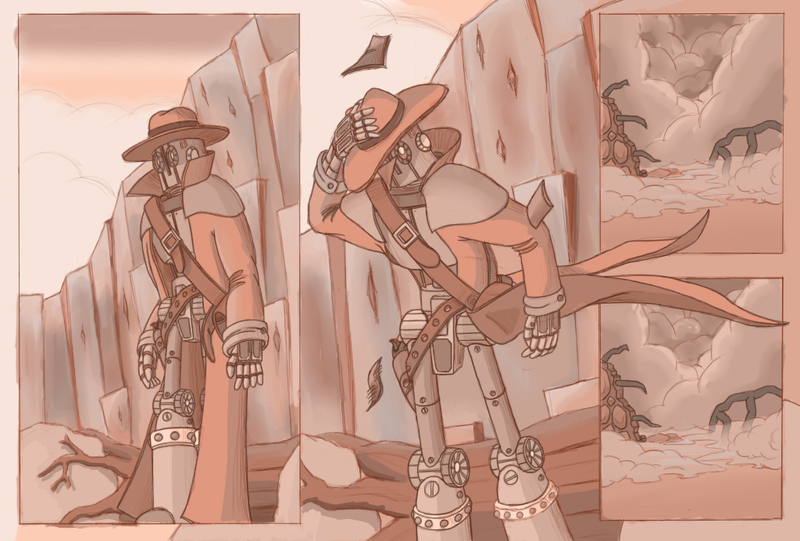 I started drawing the pages using a brownish / reddish rust color, and I maintained that color palette throughout the entire process. The end result was posted as “Page 1,” and it seemed to receive positive feedback across the board. 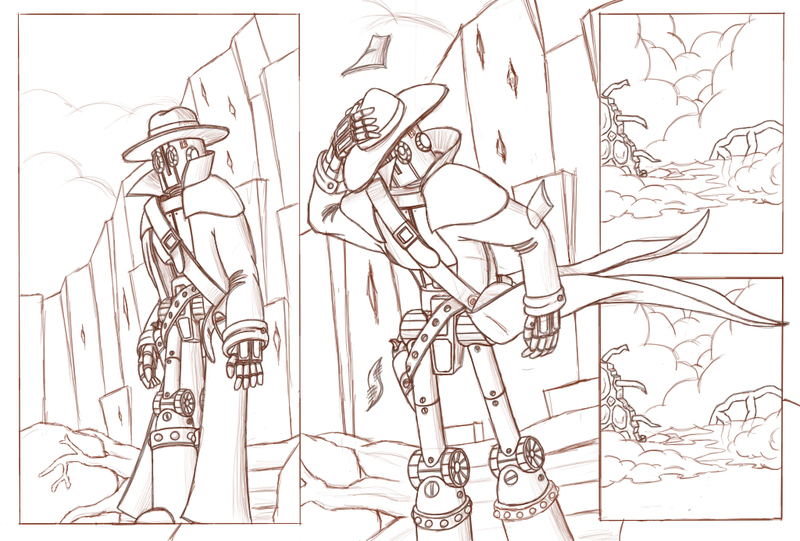 What you’ll see below are the various stages of “Page 2” of this comic-in-development. I decided to write this article because a few people have been curious about my creative process when drawing a page, so I exported out each layer of my artwork and wrote up my thought process surrounding each stage. All pages below were done using Alias Sketchbook Pro. Adobe Photoshop was used for the special effects and lettering. While this process differs slightly with each piece of artwork I do, the techinque doesn’t stray too far from the core concept. I’ll start out with a confession: this is not the original pencil rough of this page. The roughest lines were actually erased as I tightened them up. What you see here is the page after my first clean-up pass. The idea is simple, though, you just draw how you want the page to look. Do it quickly, do it cleanly, or do it roughly … it doesn’t matter at this point (unless you’re under a deadline). The important part is to get the image on the page. Concerning the content; I knew that SAM was standing far enough away that he wouldn’t be incinerated by the nuclear blast from Page 1, but I still wanted to show the effects of the explosion. So I figured that he’d get caught by the shockwave that has traveled outward from ground zero. The last two panels are shots from inside the rubble. 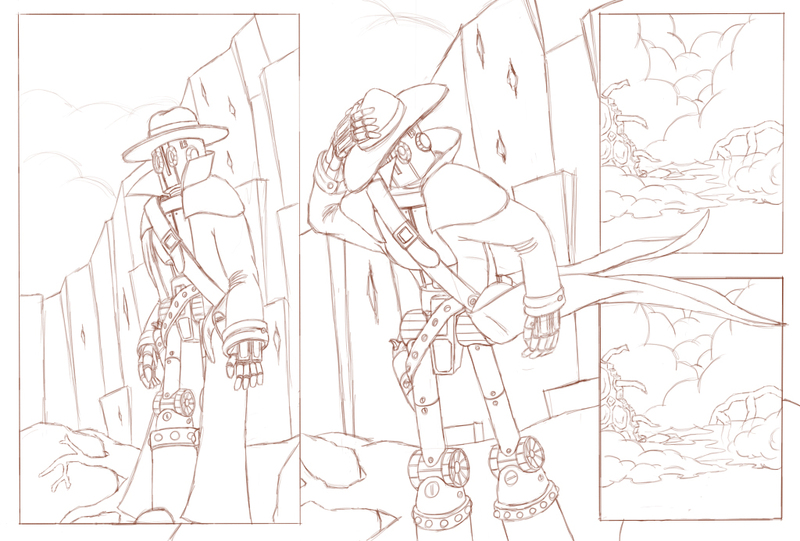 A few clean-up passes later (I do about one to two, for a total of two to three three passes overall), I have this final pencil page. You can see that it’s a bit darker than the previous, and there are hints of shading to help guide me at a later stage. Since I knew I wanted to have some of the loose sketch lines in the final image to achieve some grit, I made sure to keep those bits of shading almost as dark as the primary lines. This stage is done on a separate layer. You’ll also notice that I added a few pieces of flying debris. I wanted to make sure that it was clear that SAM was standing in a shockwave blast, and not just a strong headwind. But I also didn’t want to clutter up the page with distracting detritus. At this point I break out the darkest color “rust” I use and outline only those things that I want to really show. 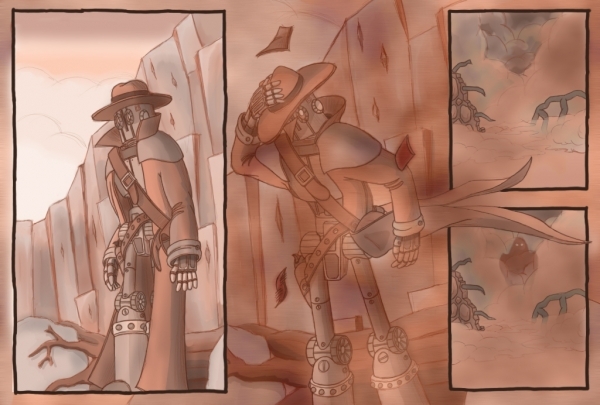 In the case of this page, it was the main character and some of the foreground debris. From this point, it’s difficult to tell a difference, but since the inks are on a separate layer I have more freedom to play with the coloring beneath the ink line instead of above it. This, coupled with tweaking the blending style and opacity in Photoshop, can make for an interesting emphasis on the specific objects outlined. For many of my images, if the background serves as little more than scene placement, I want it to fade … well … into the background. This is why I didn’t bother to ink the stone wall behind SAM. If there was to be emphasis on the page, I wanted it to be on the primary subjects. Conversely, in Page 1, I also inked the mushroom cloud, since that also needed focus. Now we’re on to coloring! The first step is to lay down base colors for the entire page. This is done under both the sketchwork and the ink lines, and it’s important that you keep these layers separate. What you want here is a basecoat of color—something you can blend with as you build up the image’s depth. 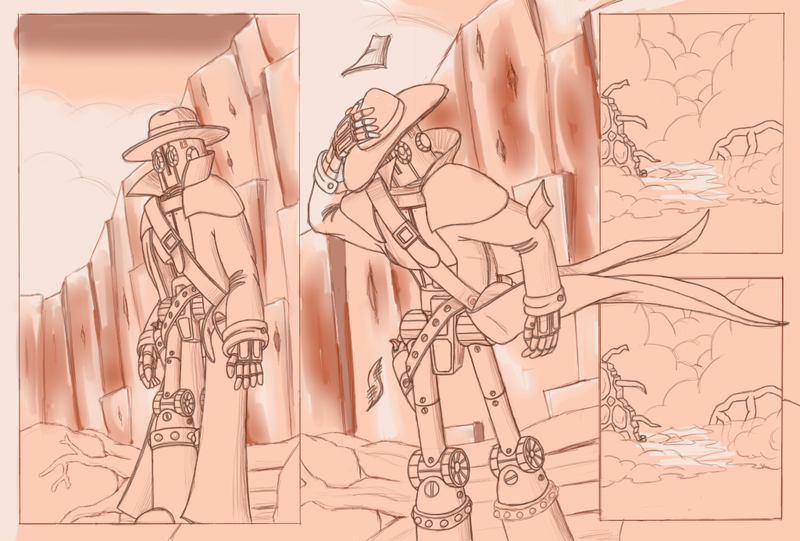 A few bits of preliminary texture are created for things like the background stone, too. This stage, again using a new layer, blocks in the primary colors of the image. If you know you want the coat to be a specific color brown, you paint that here. 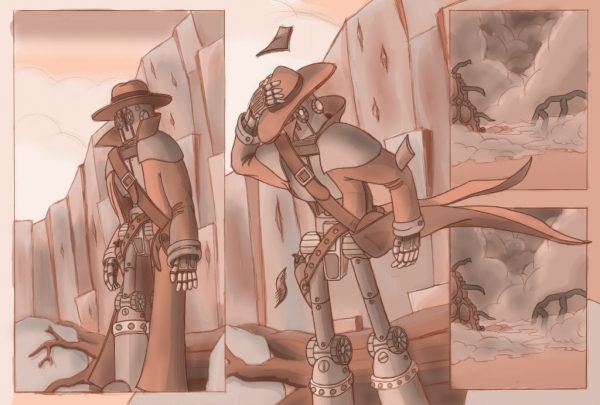 You can clearly see how there’s a distinct separation between the foreground and background now and each subject is properly colored its own shade of rust. Now the page begins to “pop” a little. The gray layer is set to a lower opacity (the exact value is purely based on personal judgement) so that the grays will darken or lighten the blocked-in colors beneath. Because I only use a palette of six rust colors, the gray layer allows me to further seperate each section by making an object lighter or darker than the base. 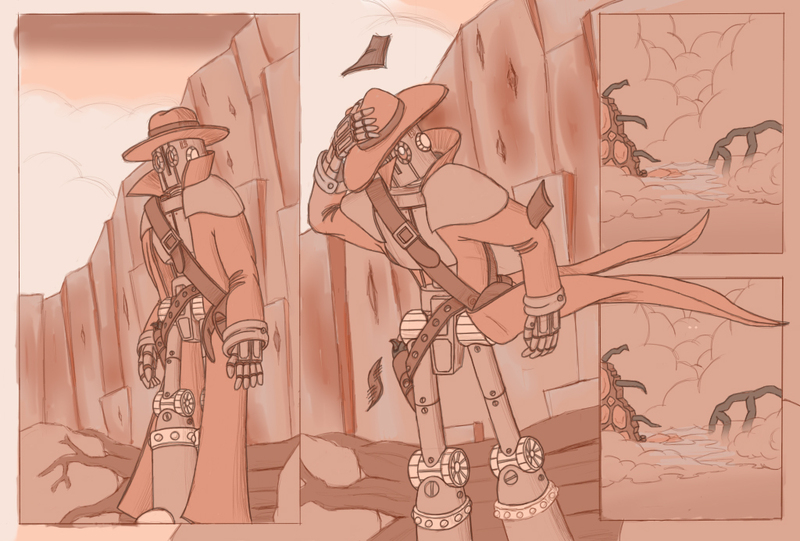 You can also see that I’ve added some shading here, further increasing the depth of the image. When I’m satisfied with the gray layer, I create a new layer and airbrush a standard black into the areas that need specific shading. I even re-shade the previously shaded parts over the gray layer, to further increase constrast and depth. Finally, I reduce the layer opacity so that the shading itself blends appropriately and doesn’t look too stark. I also do the same with white. Using Photoshop, I add in whatever final special effects are necessary. For this particular page, I knew that the second panel would show the shockwave from the nuclear blast finally reaching SAM’s vantage point. I generated an appropriately colored cloud and used a few motion blur filters and grain to give it the appearance of a blast of dusty wind. Notice, however, that this dulls the previously bold ink lines and contrast of the image, which is why I made it stark in the first place. I still wanted the reader to see SAM in that second panel. Admittedly, I drew the frames early in Sketchbook Pro. I just kept the layer turned off until now. The frame helps separate each panel, and allows me some guidance regarding where to place the speech bubbles and text captions. Oh, and yes, the crookedness of the frame’s line is wholly intentional. It’s a conscious part of the comic’s style. The last stage is the lettering. Font choice is vitally important to any comic, as it has to be both readable as well as contribute to the image itself. I chose a digitally-inspired font for SAM’s speech, since he is a robot afterall, but I wanted the caption boxes to appear almost as old paper. And because this is to be read on a computer screen and not a printed page, I chose to use a larger font size to offset some of the eye strain that comes with long term computer usage. 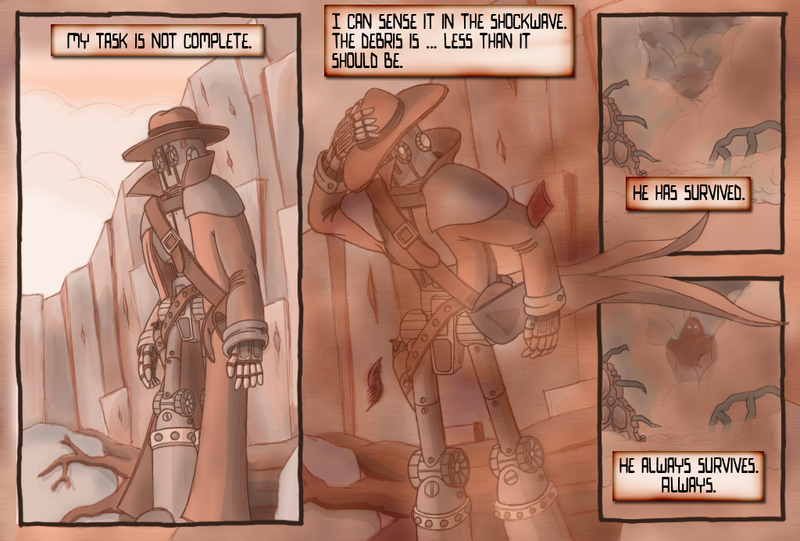 And with all that, we come to the completed second page for Rusted. I hope you enjoyed both the page itself and this short walkthrough of the process!